As Christians, we've been handed our job descriptions by Jesus Himself, in Matthew 28:18-20. But what does this look like in Anytown USA Church? What specifically should the leaders and members be doing? Peter emphasizes that all have a part in building up the house of God, and Paul tells us that every member has unique talents and gifts to bring to the body. Most autocratic churches have a leader or leaders that set the vision for the entire church. Their mantra is a narcisstic "we you know what's best for you (and our community)!" Other churches do community surveys or purchase demographic data. Still others invite all of their members together to "vision" and "dream," with the goal of creating some catchy mission statement. Each of these approaches is an attempt to guess at what will draw people to our church. But I believe we are going about it all wrong. The problem is that people don't really know what they want. I love the CNN clip of Microsoft cofounder Steven Ballmer when asked about the iPhone. He burst into laughter and exclaimed "$500... that's the most expensive phone in the world... it doesn't have a keyboard... and it doesn't appeal to business customers." As if to say, "Who'd be crazy enough to buy it?!" You see, Apple leadership was unwittingly following one of Jim Collins' principles. They knew that most people don't know what they want until they have it. And it's equally true that most people on this planet don't know what they really want spiritually, until they see it. This is why Jim Collins' hedgehog principle is so compelling! This is the third post in a five-part series. In the first post, we examined Jim Collins' first secret--getting the right people "on the bus." The second principle is to face the brutal facts about your church's future. Today, we will examine the third principle as it relates to church growth. Third, great companies and churches emulate the proverbial hedgehog. If you could choose to be a fox or a hedgehog, which would you rather be? The Hedgehog Concept is based on an ancient Greek parable that states: "The fox knows many things, but the hedgehog knows one big thing." As churches, we think we have to be foxes to outwit and catch the unsaved. But what if God wants us to be more like the hedgehog? To focus on what we can do best? 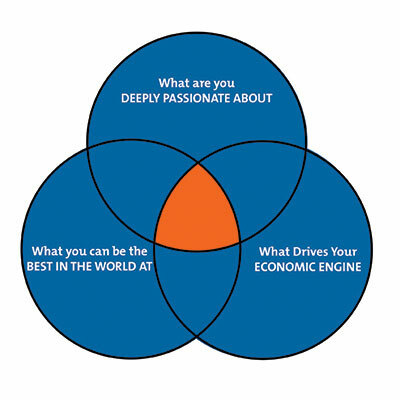 "What you can be the best in the world at (and equally important what you cannot be the best in the world at)"
"What drives your economic engine"
Notice that two of these questions revolve around people: their abilities and their passions. Even worldly leaders know that their people are at their best when they are passionate about a product or service. In the early 1980s, a group of engineers at Apple Computer became passionate about producing the finest, most revolutionary computer ever made. I remember when just using a computer was painful. Everything from opening, formatting, saving, to printing was controlled by memorized commands typed onto a blank screen at a blinking prompt. There was no "point and click" or "click and drag" or "what you see is what you get.” Using a computer meant wading through thick manuals and tedious language. Today when you use your computer--and it's easy enough for a toddler to use--you can be grateful for the men and women who poured their lives, their passion and their creativity into something they called MacIntosh. For them, this was not just a paycheck. It was their passion and vision! "Hedgehogs see what is essential, and ignore the rest" (p. 91). In other words, they have a "Core Focus." To illustrate, Collins mentions Gillette, who had discovered that cheap disposable razors sold by Walmart were eating into their profits. The obvious solution was to diversify into other products or to compete head-to-head by producing their own disposables. They did neither. Rather, they gambled $750 million dollars to produce the most sophisticated razor ever made. And why? How? Ask yourself the three above questions with a small change. What can you be the best in the world at, and equally important, what can you not be the best in the world at? What wins people and grows your church? How would you answer them? The answer may surprise you. While every individual church may be different, most Adventist church members are deeply passionate (question number three) about possessing an incredibly systematic, comprehensive and interlocking set of Bible teachings that are amazingly relevant for the time in which we live. And usually, it is this set of interlocking truths that compels people to become a part of this movement (question number two). There is no debate; other churches may have more magnificent buildings, riveting preaching, and soul-grabbing music. In comparison, many Adventist churches seem like high school Amateur Hour. In one community, I pastored one of the largest Adventist churches in the area, with hundreds in attendance. My non-denominational colleague not far away, however, preached to thousands in what can only be called a triple-espresso worship service. One Sunday, the high energy of his magnificent production climaxed with the pastor driving onto the stage in his gleaming new automobile. I can't compete with that--and I don't really want to. It's not my passion! It's true, Jesus did give us a mandate to reach the masses. All of us are commanded to "Go!" But go and do what? You see, there are things we can do better than anyone else in the world--things that we are fanatically passionate about and that will magnetically draw people who are tired of theatrics and longing for more. I'm sure you can think of others, but here's what's at the top of my list: We have an amazing set of interlocking truths that, fitting together, reveal a God that our world longs to love. Nobody else comes close. Other churches may have some of the same pieces, but honest seekers are charmed by the way 'our' pieces come together so easily without having to be 'hammered' into place. In Sabbath morning classes in my last two churches, I taught a series on basic Bible beliefs and took questions from participants. Many times, I'd find myself teaching topics I hadn’t prepared for. I'd start out going through the next study in the series, only to find out that my hearers were asking about how to keep Sabbath, or about what the Bible says about speaking in tongues or out-of-body experiences. Often these impromptu studies were more interesting than the ones I'd prepared! The class would start out with only Adventists, but ultimately non-Adventists became the driving force. I remember one couple that would drive an hour just to be at my 9:30 a.m. class. Others would show up with a Starbucks cup in one hand and their Bible in the other. One influential evangelical woman who regularly attended, but never became an Adventist, would urge her friends to come, saying, "Pastor Marlan's Basic Bible Beliefs class is amazing! Don't bother staying for his sermon which follows--but don't miss the class!" Think you have to be a pastor to do this? Think again. There was one couple that held a Tuesday night study in their tiny home, which was packed with visitors and members who enthusiastically studied the theme of righteousness by faith. I know... I couldn't stay away. Neither could a Catholic priest. And I'll never forget the doctor who'd invite patients and family members to his home for a weekly Bible study. As a result scores, if not hundreds, studied with him week after week and not a few became Seventh-day Adventists. 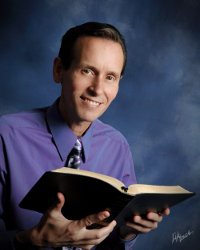 One apocryphal preacher's notes had the following note scrawled in the margins: "Weak point--shout loud!" But we don't have to "sell" Adventist understandings. Anyone honest in heart will see the sheer "weight of evidence" of Bible texts on a particular topic, and will be struck by how much "it just makes sense." This doesn't mean we shouldn't take pains to make our worship services as meaningful as possible. On the contrary, we should pour ourselves into making the services riveting and compelling. I've been to churches where the members put much more effort into using their TV remotes than into making sure that the songs they sang or the music they played was practiced and performed with feeling and excellence. Rather then diluting our energies chasing every fleeting idea, or attempting to compete with other churches, let's put our energies into doing what we are passionate about, what brings results, and what we can do best in the world. Let's train our people to handle the Word! This should be our Core Focus! Many of our members already know the Word better than many mainstream pastors! Invest in them. Grow them! Your church may discover a slightly different intersection of passion, ability, and results. But if you pursue that with excellence, your church will grow. And if you, like me, see the value of the teachings we possess, please don't settle back into your armchair of mediocrity, smug in the value of what you have. No! If your gift is teaching, learn to present these truths with energy and passion! This is the third post in a five-part series. Click here for Part 4.